Although Route 66 is no longer a commissioned highway, the famous road immortalized in song and dubbed "The Mother Road" by John Steinbeck in The Grapes of Wrath, is still marked with reminders of what made it great. Last week marked the 84th anniversary of Route 66. One of the first major numbered highways, Route 66 represented America's growing desire to be able to travel long distances by car and was a precursor to the interstate highway systems we have today. Stretching from Chicago to Los Angeles, it was a 2,448 mile route through small town America to the west coast. Route 66 was the first highway to be paved entirely in 1938. It became a major artery for those going West, supporting many of the communities it passed through. In the 1950s, as the car became an essential aspect of our culture and automotive tourism increased in popularity, Route 66 boomed. It was a route to California which included the Painted Desert and the Grand Canyon as well as other more quirky road side attractions. All along Route 66 restaurants, motels, and other tourism dependent businesses were everywhere and thriving. Interestingly, it was during this boom in 1956 when President Eisenhower passed the Interstate Highway Acts that would eventually render Route 66 obsolete. Within ten years many sections of Route 66 were being completely bypassed by these new-fangled Interstate Highways. This had a devastating effect on many of the small businesses that relied on passing travelers to stay afloat. The boom was over. 25 years ago it was officially decided Route 66 was no longer a relevant road and was officially deactivated (removed from the United States highway system) on June 27, 1985. The Interstates had officially replaced the once important highways. Various fates met the remains of the different sections of the road. These included everything from being split up as local and state roads to being totally abandoned in some areas. As you can tell from these pictures, reminders of a past era are everywhere on the different sections of what was once "America's Main Street". From the neon signs and dated architecture to the old cars, Route 66 is still littered with reminders of what it once was. Route 66 is no longer numbered or shown on maps and it is impossible to take what was the old Route 66 continuously from start to finish. Despite this, with careful planning, it is still possible to take Route 66 most of the way from Chicago to the California coast. It is a dream of mine, like many car lovers, to someday take my own relic from the past down as much of Route 66 as can still be traveled. Although the promise of a road trip in an old car anywhere is attractive enough, there is a particular draw to Route 66. 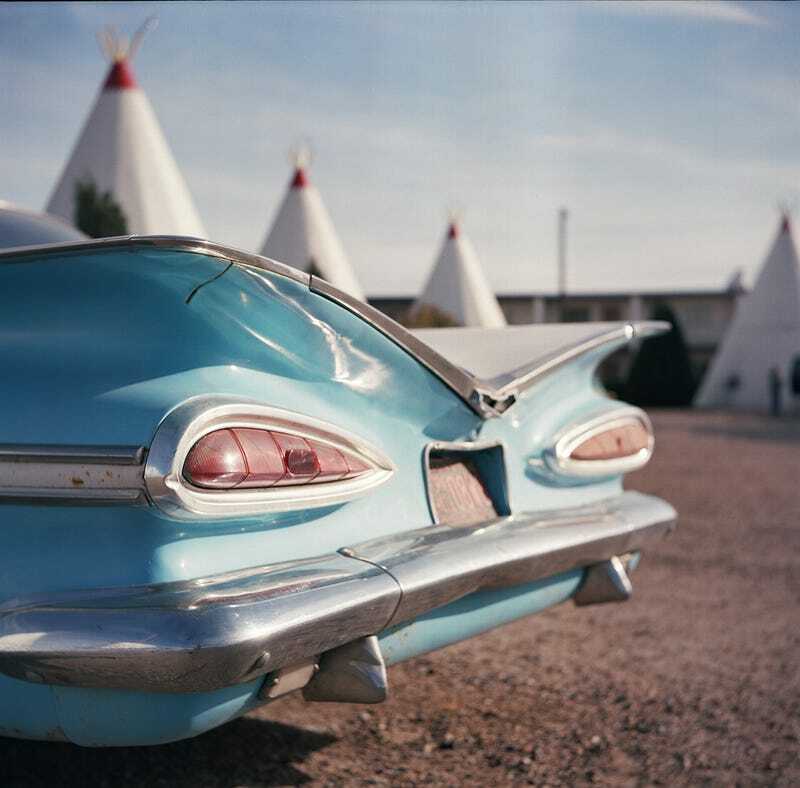 The idea of traveling the road in an old car, eating at diners and staying at motels with neon signage seems like as close as you can get to going back in time.